Are you the Lucky Angler who can lure the catch of the day. If you’re a pro fisherman or simply enjoy angling themed 5 reels then this slots online is the perfect hook for you. 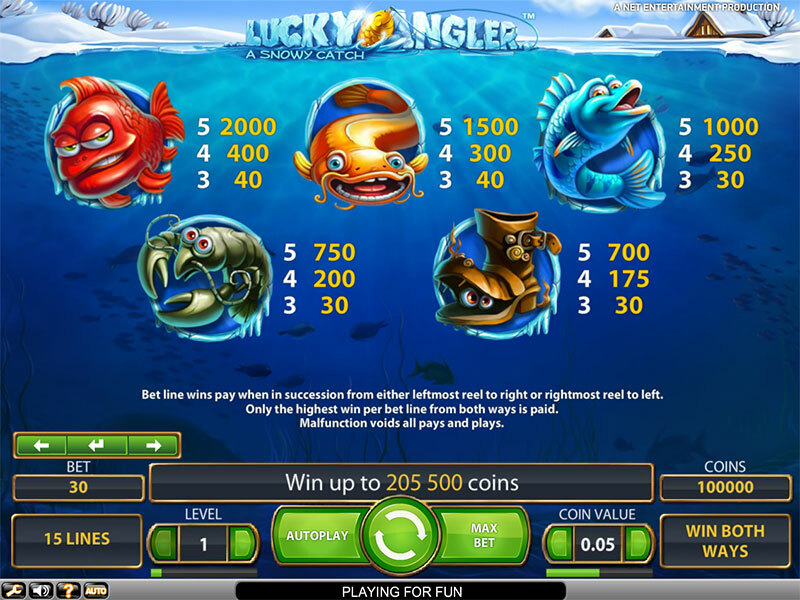 Cast your line and hook some free spins and whopping bonus Wilds. NetEnt is a Swedish company that was founded in 1996 and is among the most successful online casino software providers. Boasting over 300 fully licensed portals, it is clear to see how the developer has maintained a strong reputation over the last 21 years. Over the years they have overtaken other casino industry giants such as Microgaming, IGT and Novomatic. 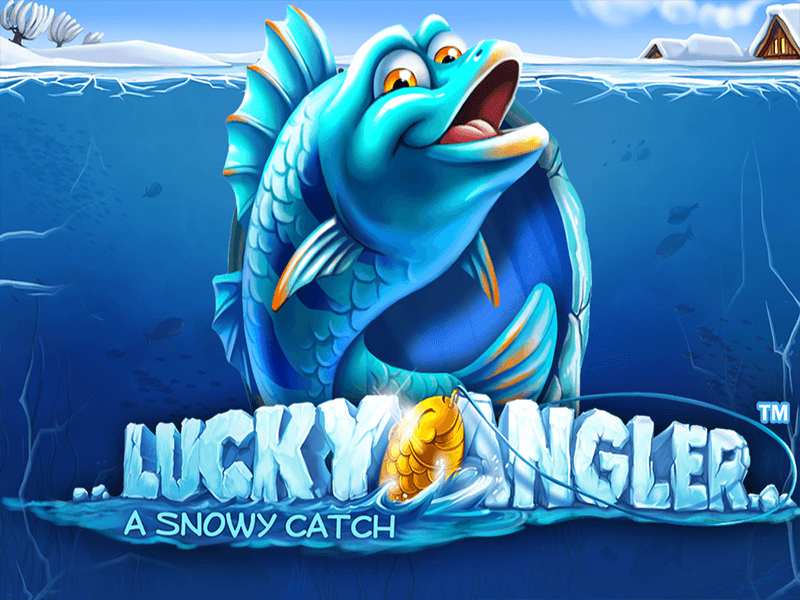 Aside from this, they have created several slot-games, one of which is Lucky Angler, which allows you to experience a frozen lake from underneath without the drawback of inheriting hypothermia if you were to attempt this yourself. NetEnt provides you this experience in the comfort and warmth of your own home and you can read more about there other games here. If you’re willing to face the prospect of bitterly cold winds, it will be so worth your time and efforts as a tingling jackpot of 205,000 coins is up for grabs! Set in the deep Antarctic, the 5 reels, 15 pay line is set up against a cobalt and icy blue background, with smooth and fun animations of lobsters, fish, and smelly boots – the one thing you don’t want at the end of your fishing reel. Scatter symbols are a highly desired element in this game as you can win up to 20 free spins, providing you matching 5 of them. 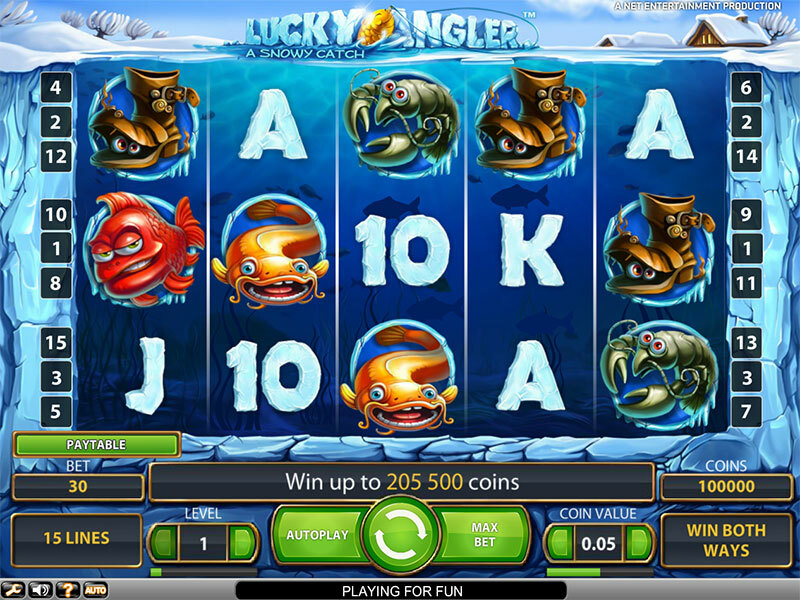 As a result, these spins will continue the last bet you placed, meaning that you are getting more fun and enjoyment out of just one spin, making that minimum 30p spend even more lucrative and tempting as you plunge in the icy cold waters to capture your fortune. Check our homepage for more easy slot games. For more information on how to pay by phone slots, visit here! 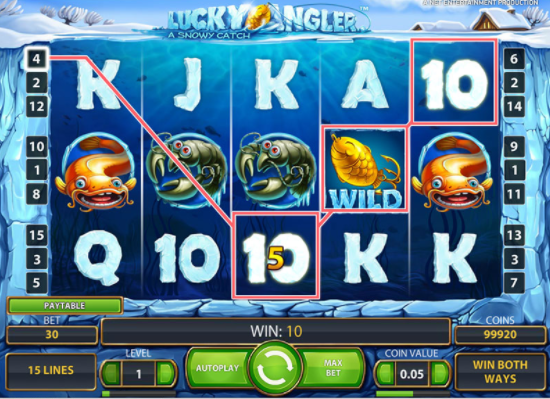 Once you have secured a wild symbol in combination with other symbols on a pay line, which is represented by the golden fish hook, it is conveniently frozen for 3 more spins after that to give yourself the best chance in securing a higher reward when it is combined with other symbols. This is unusual for a slot game to do this, NetEnt are practically throwing chances at you! Lucky Angler also features another unique aspect. Unlike traditional slot games that reward you with winning combinations from left to right, you can win both ways, essentially doubling your chance of winning something big from just 1 spin. The minimum bet starts at just 30p and the max £150 so NetEnt has truly encapsulated a large audience of players, to ensure everybody can have fun no matter how much they want to risk. The game also allows you have up to 1000 automatic spins, meaning that you can still have a productive day getting up to the usual house chores whilst potentially hooking some cash at the same time. We also often run various slot promos with this game. The frozen wild symbol and the 1,000 automatic spins are by far the most appealing aspect to the game. Being able to have your hands free to tend to other tasks and still make money, could you ask for anything more? and with bets starting at just 30p, we advise that you draw in your hook and see what you can catch today! More popular Easy Slots game are waiting for you! Join today!